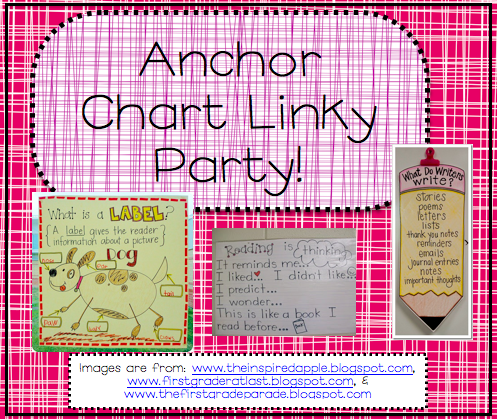 Anchor Chart Linky Party–coming soon! Get those anchor chart photos ready to share–starting Friday, March 16th!! My very good friend Ms. M from Ms. M’s Blog and I are hosting two linky parties…all devoted to anchor charts! We’re inviting you all to join in and share some of your favorite anchor charts and link up with us. Please check back Friday for these linky parties–we would love to see your charts! Do you think you’ll be able to stop by for the party? I’d love to hear if you can! Thank you!! Blogroll being fixed!!! This sounds like fun! I'm in! Ha, ha! I'd love to see your outfit! Can't wait for the linky party. I love anchor charts and would love to see everyone's ideas. Thanks for hosting! Have a great Wacky Wednesday! I am so excited to the linky party! I can't wait! I hope you are having a great week. It has been in the upper 70's this week! Crazy weather for Kansas this time of year!! Ooohhh.. I love this idea! Can't wait! I love the anchor charts on the buttons, so very cute! I'm new to blogging and teacher blogs and love your blog! Thanks for the great ideas! Hopefully….eventually I hope to share my creative ideas too! Thanks for the inspiration! I'm sorry, you will be, I'm still sorting by grade levels!!! Kristin!! thank you for sharing such great ideas! i'm happy your blogroll is up and running :o) i may have to do the same thing–silly blogger! OOOOHHHH so excited….what a great idea!!! I cannot wait for this one! I love seeing other people post about their anchor charts! Plus, I'm a visual learner, so this makes it even better! I am going to try to attend. It sounds fun and informative. I'm attending for sure. Thanks for hosting. Great idea! What a wonderful resource that will be for us all. Can't begin to say how excited I am about this! I am new to the bloggin world, check out my blog if you get a chance.